Summer is here and we’re already planning our next kayaking trips or beach get-together. One of the things you shouldn’t overlook when making plans is choosing a good hat, whether it’s for a vacation or for day to day use. Not wearing a protective head wear during summer isn’t just uncomfortable, but it can be a health hazard, too. 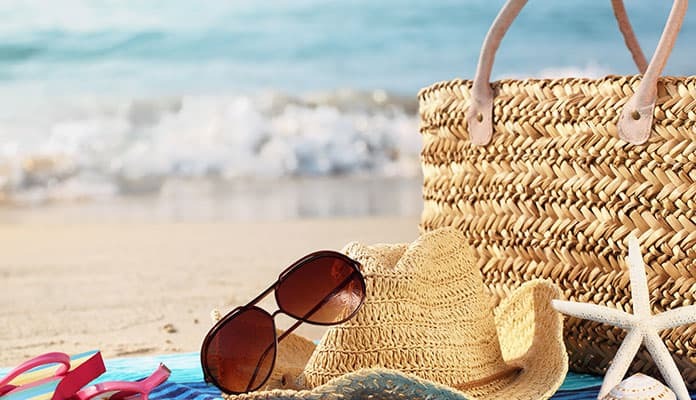 Browse our reviews of the best sun hats to consider this year; after this, choosing the one that suits you most should be a breeze. 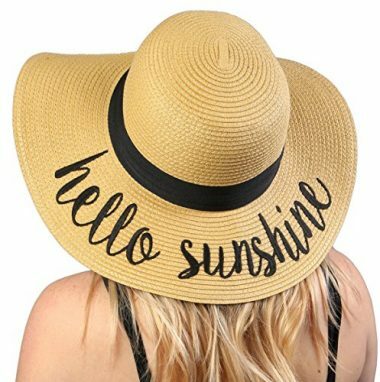 A cute and stylish hat which can be worn on almost any occasion, regardless of whether you’re going to the beach, on the boat or simply going out on a summer day. This Sloggers design is one of the top rated sun hats because of the wide brim. Since sun rays are the main culprit behind skin aging, a wide-brimmed hat is ladies’ best friend, hence the popularity of this particular model. You can choose from several color variations in case the standard one doesn’t suit your taste. Each model comes with a high quality band which ensures extra comfort and a better fit. 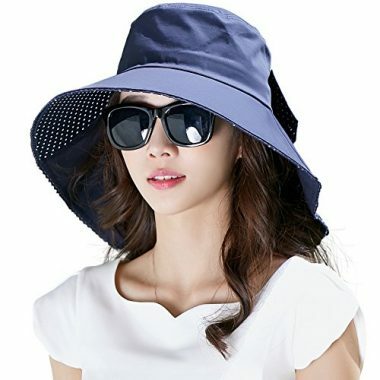 Women who wear small and medium cap sizes will find that the sun hat suits them best. The hat measures 22 ½ inches around. The Sloggers sun hat is certified to carry a 50 SPF filter, placing it in the high protection category. If you’re very protective of your skin and wary about sun rays and the potential damage they can bring, this is the hat for you. A lightweight hat that won’t encumber you at all, but will offer high protection against the sun, wind, and humidity. Sturdy and heavy duty, the Outdoor Research hat is also surprisingly comfortable even when wearing it for a long time. The brims of the sun hat are foam-stiffened, but the flexible piping technology makes the brims resist intense wind without displacing the hat from your head. The same foam piping makes your sun hat float if you accidentally drop it in the water. The Sombriolet hat also comes with a TransAction headband for a secure fit, as well as extra cord adjustments that will help keep it in place. While wearing it, you will be protected from sweating as well, since the inner headband has an anti-dripping system which also allows aeration. It’s one of the best hats for men who really want perfect UV protection daily. 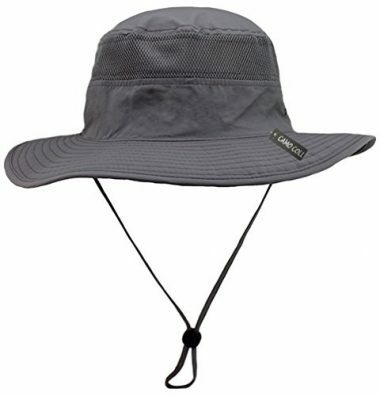 One of the most popular UV protection hats for hiking, backpacking, and traveling, this Camo Coll sun hat is quite affordable and comes in a wide variety of colors. Considering its price, you could even buy several and choose a different color according to mood or outfit matching reasons. You can use the adjustable drawstring for securing the hat tightly in place, so it stays put even on windy days. Its diameter is 7.5 inches and fits women who wear Medium for their cap size. The Camo Coll hat is made of a soft touch polyester with air vents and has a sun protection factor of 50+. The brim size is about 3 inches so it can protect you well enough, but while still remaining in a casual range as far as style goes. 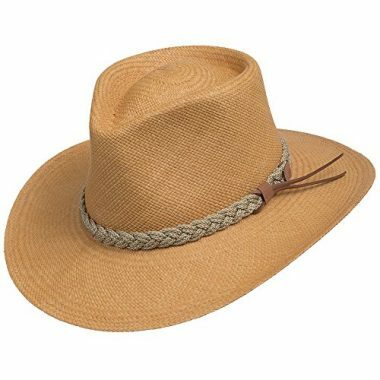 The hat is a popular choice for hiking and camping trips, as well as for day trips at the beach. An Aussie-style pick, this Henschel design is one of the best men’s sun protection hats on the market. Made from a highly durable heavy duty UV protection fabric, the hat is also stylish enough to make you look impressive even when worn on a casual day at the beach. It’s one of the few truly packable hats that doesn’t get damaged or misshaped after packing and unpacking it. 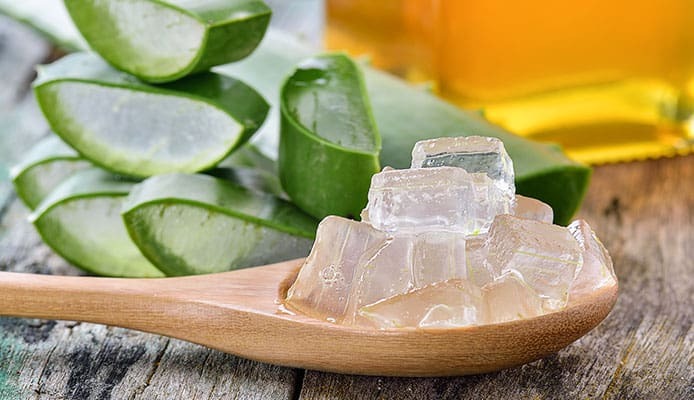 Therefore, if you want to bring it along for protection from the sun and wind on a camping trip or outdoor adventure, it’s among the best choices. Another popular choice because of its ability to maintain shape through folding and packing, the Siggi Women’s cover is a dream come true for all who are searching for portable protection and comfort. The adventure hat has wide brims and a high level of UV protection (50+). 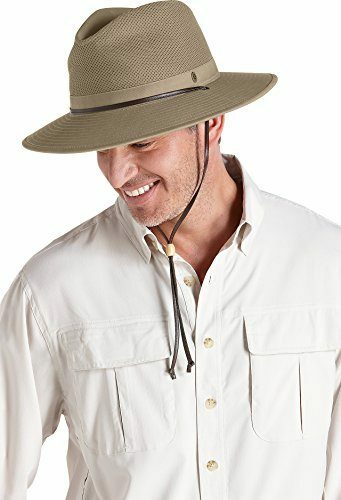 The Siggi sun hat comes with an optional ponytail hole (if you like wearing your hair like that and would like to pull it out through the back of the hat) and chin strap. What we like about it is the lightly punctured pattern on the brim; it gives the head wear a certain something that makes it instantly classy. There is also a little bowknot at the back of the hat that allows for better adjustment, in case you need it. Anyhow, you can choose your size, so fitting shouldn’t be a problem. This Funky Junque model is one of the most popular floppy beach sun hats for women due to its modern and cool design. There is an embroidered message on the back of the brim, and you can choose from several options for this message, as well as from a few color options. As far as UV protection hats go, this one is the most likely to turn up at summer festivals and other places where people with great style go to. It can be adjusted with a drawstring and it measures about 23 inches on the inside. Remember that the hat arrives folded, so it needs to be unpacked and left to regain its normal shape before you can wear it. Some of the hat reviews pointed out that this was somewhat of a disappointment, but only because they could hardly wait to wear it. Getting it back into its original shape isn’t a problem, not even if you fold and pack it for traveling every now and then. 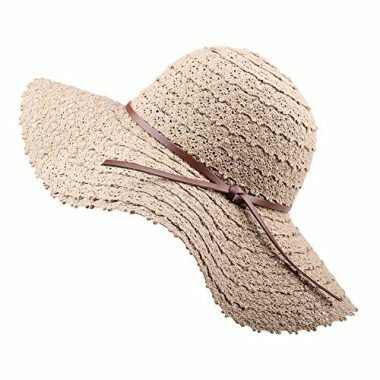 If you love light-colored vintage lace dresses and the imagery of white-clad elegance on the beach, then this is the best travel hat for you. In spite of the lacey appearance, the Furtalk sun hat is actually equipped with all the modern tech you can expect from a high-performing protective head wear. There is an inner string for adjusting the size (though the hat already comes in 2 sizes), as well as a cotton based inside lining and a sweatband which will keep you cool. The leather bow tie on the outside is detachable but gives an extra touch of style when worn. But by far the key feature of this hat is the resilience to folding and packing. Even when heavily folded for a long time, it will spring back into shape, maybe with a little help from a steaming device. This makes it one of the top rated hats for travel, in addition to a classy style choice. 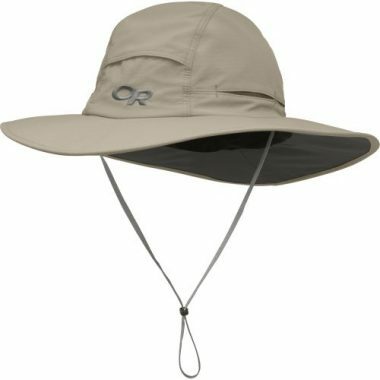 A crowd favorite with men of all ages, the O’Neill brand is one of the market leaders in the niche of sun hats for men, and with good reason. Their sun hats are carefully crafted from natural materials (sea straw, in this case) and offer a high level of protection, from sweat, UV rays and other elements. The brims are generous enough to shield you well (4 inches), and as for the sun hat itself, you can choose from multiple sizes to get the one that fits you best. 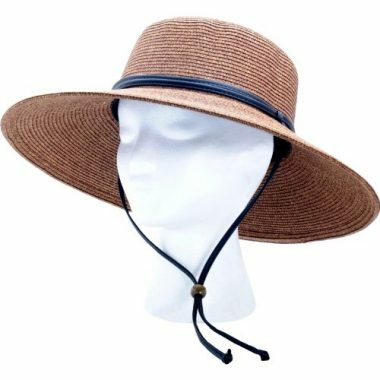 The sea straw fabric is much more resistant than other natural materials (including other straw types), making it one of the best sun protection hats possible. There is also the logo glued to the sun hat, which some people choose to wear proudly. If you don’t like it though, keep in mind that it can be easily removed by cutting around the glue. A blend of cotton and polyester keeps your head cool and well-protected against harmful sun rays and sweating or discomfort. 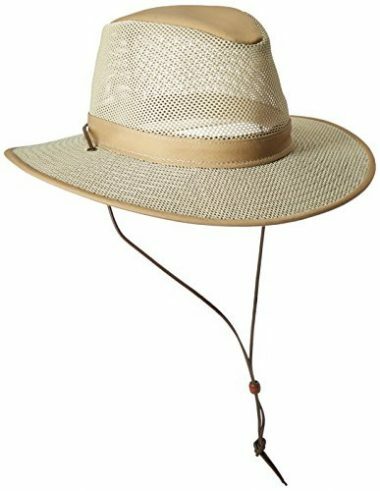 The Coolibar sun hat for men comes with an elastic band on the inside and an adjustable chin cord, both of which will provide the best fit. Like all of the best sun hats for travel, the Coolio hat is easy to fold and refold and you can take it with you on all your travels. The shape will be maintained flawlessly; this travel hat is famed for being wrinkle-resistant in addition to crushable, foldable, and packable. This makes it the top rated sun hat for frequent travelers. Due to the polyester in the composition, the Coolio hat is also mildly stretchable, for a perfect fit. Still, there are also multiple sizes to choose from so fitting it will really not be a problem. 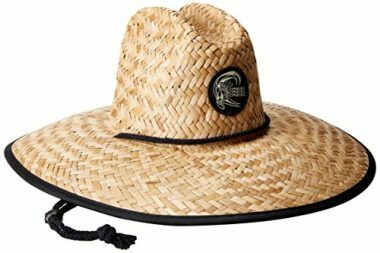 The most popular choice when it comes to high-end men’s sun protection hats, the Ultrafino is so classy it could justly rival the world’s finest Fedora. The shaped crown will add extra style and long wear resistance, but on the interior you will find that the sunblock hat was designed with comfort in mind first and foremost. The natural materials come from Ecuador, where the hat is also hand-woven before getting the final touches applied on American soil. The charming details are immediately noticed, and the fit is perfect. If you’re looking for protective head wear that looks good and you’re willing to pay for quality, then this is the hat for you. There are so many models and shapes of hats on the market, that you might be tempted to choose one based on style alone. 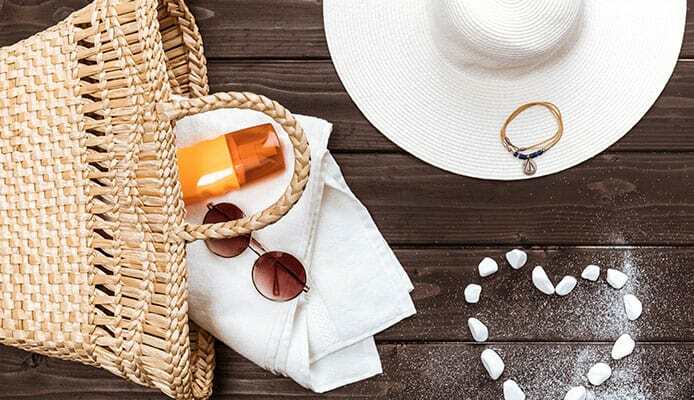 To avoid getting a sun hat that doesn’t match your needs, here are the main things to keep in mind before taking a decision. If you’re going on outdoor adventures where a large portion of time will be spent in the sun (like water sports, spending time on a beach blanket, hiking or camping), you need to look among the top rated outdoor travel hats. The same goes if you work outdoors, since it will also expose you to sun rays much more than the average person has to face them. High solar protection should be the factor that matters most, since the potential danger posed by sun rays is very real and you will be highly exposed. More on the necessity to wear a sun hat below, in the FAQ section. If you’re only shopping for a sun hat to be worn on a casual afternoon out, you can allow yourself a bit more leeway to look to great style first. All sun hats offer at least some amount of protection, and it will probably be enough for a casual stroll on an afternoon out. We know there are many tempting styles out there, so feel free to go for what looks best to you. Gangster looks or cute embroidered messages are all in! While most head wear products will claim a high level of UV protection, keep in mind that this is a give and take fact. Not even the highest rated sun hats can completely protect you from the potentially damaging power of the sun’s rays. At best, the protection offered by good sun hats is at around 98%. This is all pretty easy to understand if you think of the little holes you can notice in the weave, if you examine your sun hat closely. The more light is allowed to pass through, the less effective the UV protection is. After all, the sun protection offered by a hat is still just a mechanical block. For ideal protection, especially if you don’t have hair on your head, you should put on a layer of sun protection cream as well before wearing your sun hat. But even if the protection offered by sun hats is imperfect, it is still an important part of staying safe during summertime. Look for tighter weaved fabric when shopping for a sun hat and you will maximize its performance. Q: Why Do You Need a Sun Hat? A: Health authorities of almost every country in the world warn all citizens to be wary of the sun’s harmful rays during the warm season. As research progresses, we become more and more aware that while the sun sustains life, unfiltered exposure to its rays can be very dangerous to our health. Skin cancers and accelerated skin aging are just two of the concerns to think about. 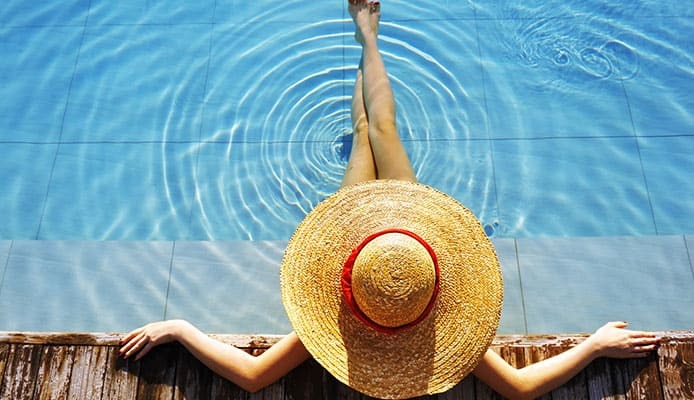 To follow the safety recommendations of doctors, everyone should wear a sun hat during the warm season, especially since the head is one of the most exposed areas of the body. Clothing is our first line of defense against UV rays and our heads should not go without it. 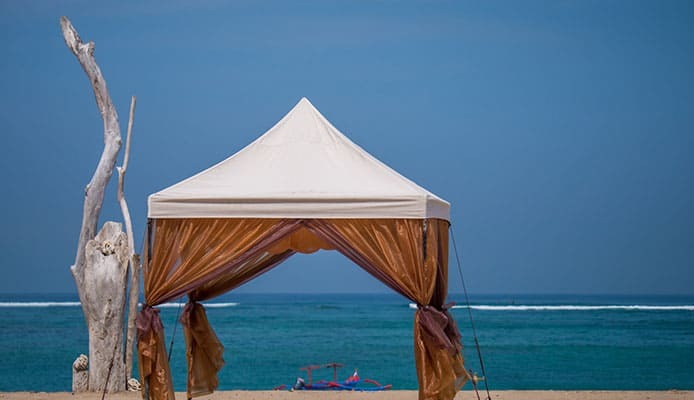 You should also use a beach umbrella if you spend time on the beach, it will help protect you more. Wearing a sun hat during the warm season is a necessity. If you live in a particularly warm region or work outdoors, it’s even more mandatory. But this doesn’t mean it has to be a bore! The best sun hats on the market combine style and functionality into a great product. You just need to choose what suits you most, and we hope this guide helps. What kind of hats do you like to wear? Do you specifically wear sun hats to shield yourself from the sun? What do you like most in a hat? Share your tips with us in the comments!